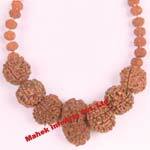 One Mukhi representing Sun in centre surrounded by one Two Mukhi representing Moon, 1 Three Mukhi Rudraksh representing Mars, 2 Four Mukhi Rudraksh representing Mercury, 2 Five Mukhi Rudraksh representing Jupiter, 1 Six Mukhi Rudraksh representing Venus, 1 Seven Mukhi Rudraksh representing Saturn, 1 Eight Mukhi Rudraksh representing Rahu and one Nine Mukhi Rudraksh representing Ketu. Eleven auspicious beads representing Nine Planets controlling our lives. 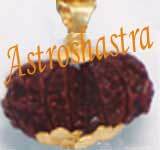 Those who do not know their Date of Birth or are not sure of their Date or time of birth can wear this Navgrah Rudraksh Pendant. 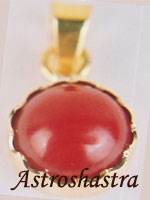 This Pendant appease all the negative planets and gives power to benefic planets. 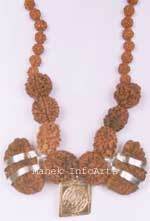 Navgarh Rudraksh Pendant is the one pendant, which shall definitely be worn by everyone. It does not have any negative effect. It would definitely give you benefits. 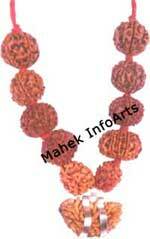 This Navgrah Rudraksh Pendant has the powers of One Mukhi Rudraksh to Nine Mukhi Rudraksh. Wearer is blessed with every happiness in life. 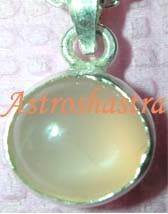 Maa Durga , Maa Lakshmi , Maa Saraswati always protect the wearer from all problems in Life. Lord Ganpati always stay with the wearer to help and remove obstacles in ones life path.